From the best-selling author of the classic Moosewood Cookbook comes this collection of 50 dessert recipes in a compact easel format for easy reference. The Moosewood Cookbook was inducted into the James Beard Foundation Cookbook Hall of Fame for its significant and enduring impact on the way we cook and understand food."" Mollie Katzen was named by Health magazine as one of the five ""Women Who Changed the Way We Eat."" 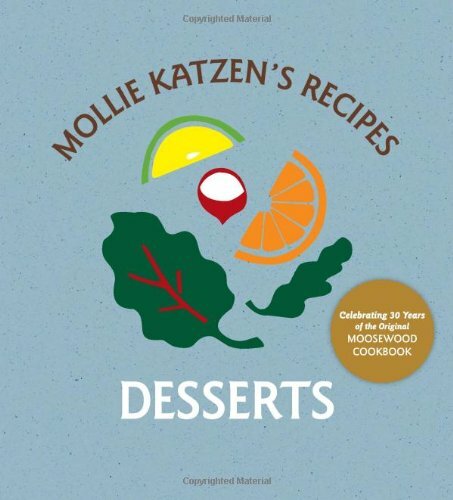 Mollie Katzen has been credited with moving vegetarian cooking from the fringes of American kitchens to mainstream dinner tables. She knows there are few pleasures greater than pulling perfectly moist brownies out of the oven or polishing off the perfect cheesecake. This book brings together Mollie's much-loved sweets from the Moosewood Cookbook and the Enchanted Broccoli Forest in this convenient stand-up easel format. Each recipe is lovingly hand lettered and illustrated with Mollie's distinctive pen-and-ink drawings, making this timeless collection the perfect kitchen countertop companion.